Wall Street shares slid sharply again on Thursday, compounding losses on the Dow Jones Industrial Average and S&P 500 which started last week. The Dow Jones Industrial Average fell by more than 1,000 points for the second time this week, plunging 4.15% to 23,860. The S&P 500 dropped 100.6 points or 3.75% to 2,581, while the Nasdaq slid 274.8 points or 3.9% to 6,777.1. The moves follow a day of losses on all key European exchanges. The 100 share index in London closed down 1.49% at 7,170.69 points. Germany and France fell 2.6% and 2% respectively. The dive extends a sell-off that started last week, as investors started to worry that inflation might rise more quickly than expected, leading policymakers to raise interest rates. On Thursday, the Bank of England seemed to offer support for that view. The bank left interest rates where they were at 0.5% at its meeting, but said a strengthening economy meant interest rates were likely to rise sooner than the markets were expecting. What has driven the Dow's surge? Also worrying markets was a government budget proposal US lawmakers in Congress have announced, which raises spending caps and could fan inflation. Bond yields in the US have also risen in recent weeks, typically a signal of higher rates. Higher interest rates push up borrowing costs for companies and individuals, which can hurt corporate profits and curb economic activity. The uptick in volatility comes as investors react to the shifting conditions. Thursday's declines mean the Dow and S&P 500 have now fallen by more than 10% from the record highs set in January, a threshold analysts call a correction. 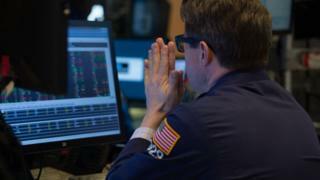 Shares in financial, technology and consumer companies led the declines on Thursday, which infected every sector. American Express and Intel were the two biggest losers on the Dow. Analysts, who have said for months that the financial markets were due a correction after a long period of rising prices, urged calm. "The latest decline takes us back to where we were 17 November," said Greg McBride, chief financial analyst at Bankrate.com, which tracks interest rates. "We've just given back some recent gains, not wiped out anyone's life savings." But the declines have led to questions for President Donald Trump, who had repeatedly boasted of the market's rapid rise in value last year. The White House said on Thursday markets were reacting to data that is good news for the broader economy, including low unemployment and signs of wage growth. "The president like the rest of the White House is concerned about long term economic indicators and factors," a White House spokesman said. "The fundamentals in terms of the long term are very strong." Ahmed: Will fall turn into rout? Did robot algorithms trigger market plunge?